DNA arrays are valuable tools in molecular biology laboratories. Their rapid acceptance was aided by the release of plans for a pin-spotting microarrayer by researchers at Stanford. Inkjet microarraying is a flexible, complementary technique that allows the synthesis of arrays of any oligonucleotide sequences de novo. We describe here an open-source inkjet arrayer capable of rapidly producing sets of unique 9,800-feature arrays. The DNA array is a powerful tool for the high-throughput identification and quantification of nucleic acids. Among other uses, array analysis has become a standard technique in the molecular biology laboratory for monitoring gene expression. Arrays can be made either by the mechanical spotting of presynthesized DNA products  or by the de novo synthesis of oligonucleotides on a solid substrate, usually a derivatized glass slide. As the sequences for de novo synthesized arrays are stored electronically rather than physically in frozen DNA libraries, the costs and the potential for errors in amplification, storage, and retrieval are eliminated. Piezoelectric inkjet oligoarray synthesis as proposed by Blanchard and Hood  is a particularly flexible method that allows the rapid construction of oligonucleotide arrays containing any desired sequence. By dispensing DNA monomers from a multi-channel inkjet print head, large numbers of sequences can be chemically synthesized in parallel. Development of a prototype inkjet system began in our laboratory and was continued in the private sector [3, 4]. Work by Rosetta Inpharmatics (Seattle, WA) and Agilent (Palo Alto, CA) resulted in an industrial-scale inkjet oligoarraying system and a catalog of commercially available arrays. However, there has been virtually no access to the inkjet synthesis instrumentation in basic, academic research laboratories, and high set-up fees still deter the production of specialized arrays in small batches. When compared to the rapid acceptance of the pin-spotting microarrays [5–8], the lack of access to oligonucleotide microarray synthesizers has hampered the development of new uses for this technology. The early release of the Stanford pin-spotting arrayer design  also spurred commercial development of high-quality microarrayers, which led to the availability of numerous models at competitive prices. Despite the problems and errors associated with collection of DNA libraries, the widespread availability of pin-spotted microarrays led to acceptance and standardization of protocols, terminology, data storage, and analysis techniques [9–11]. Several laboratories have modified commercial ink-on-paper printers for use in spotting microarrays. These printers were usually based on 'bubble jet' print heads containing tiny heating elements that rapidly vaporize a water-based solution in a capillary to eject a droplet containing protein or DNA, onto a solid support [12–14]. These printers, however, are difficult to clean and are not suitable for high-throughput production of oligoarrays or the parallel de novo synthesis of oligonucleotide arrays. Like pin-spotting microarrayers, they also require libraries of known nucleic acid reporters before arrays can be made. The first successful technique for de novo oligonucleotide synthesis on a chip was developed by Affymetrix (Santa Clara, CA) using photolithographic techniques borrowed from the semiconductor industry. By using photomasks and UV-catalyzed base deprotection, large numbers of oligonucleotide arrays can be synthesized with a high feature density. Chips are now being made that contain all the genes predicted to be in the human genome. However, coupling chemistry using photolabile monomers is less efficient than standard phosphoramidite chemistries, resulting in arrays consisting of short oligonucleotides (25 mers) that require multiple features for the unambiguous identification of each gene. In addition, the design and construction of new arrays is slow and expensive because new masks need to be cut for each base changed in the array. Recently, new photolithographic oligoarray synthesizers have been introduced that replace mask sets with a dynamic micro-mirror device (DMD) [15, 16]. NimbleGen (Madison, WI) produces arrays with up to 390,00 features using Affymetrix-style chemistry. These arrays are not currently available for sale in the United States, but samples can be sent to Iceland for hybridization and scanning. Instead of deprotecting photolabile monomers, Xeotron (Houston, TX) uses the DMD to photo-generate detritylating acids. This has the advantage of better yields through higher coupling efficiency, but feature density is lower. Xeotron arrays currently contain about 8,000 features. Detailed descriptions of the DMD-based instruments are not publicly available. De novo oligonucleotide synthesis using a piezoelectric inkjet oligoarray synthesizer overcomes several of the problems inherent in the pin-spotted arrays and the conventional photolithographic mask arrays. First, as soon as the genomic DNA or expressed sequence tag (EST) library is even partially sequenced, oligonucleotide reporters, including intergenic regions, can be designed and synthesized on arrays without having to clone and store large libraries. Second, the use of standard phosphoramidite chemistry for oligoarray synthesis allows longer reporters to be synthesized, decreasing the number of reporters required for confident identification of the target molecules. The POSaM (piezoelectric oligonucleotide synthesizer and microarrayer) platform described here utilizes a low-cost piezoelectric print head with six fluid channels; four channels deliver phosphoramidite precursors and one delivers an activator (ethylthiotetrazole), leaving one channel available for an optional linker or modified base. The piezoelectric jets can deliver a wide range of nonvolatile solvents in volumes as low as 6 pl. Piezoelectric jetting, high-quality motion controllers and standard phosphoramidite oligonucleotide synthesis chemistry allow users to synthesize arrays of any nucleic-acid sequence at specific, closely spaced features on suitable solid substrates. We present here the description of a simple oligoarray synthesis platform along with the plans for its construction and a detailed user manual. The POSaM platform can produce multiple unique microarrays, each with 9,800 different reporter sequences, on modified glass microscope slides. Synthesis is inexpensive and rapid; new arrays can be ready for hybridization the same day that they are designed. These arrays are suitable for a wide range of biological investigations including the study of gene expression, alternative splicing, chromatin immunoprecipitation techniques (ChIP-to-Chip), and single-nucleotide polymorphism (SNP) detection. In addition, the covalent linkage of the oligonucleotides to the substrate is sufficiently robust to allow for re-use of individual oligoarrays without a detectable change in the signal-to-noise ratio. 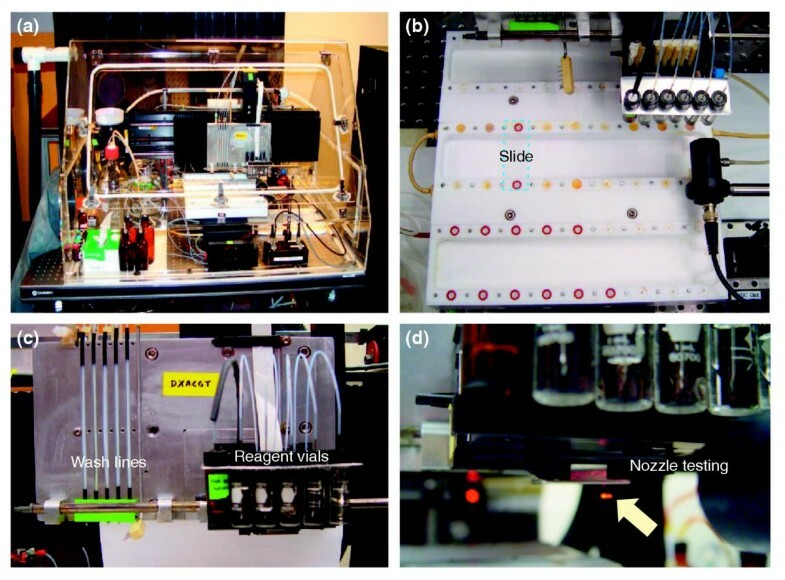 Our goal was to construct an instrument that most molecular biology laboratories could assemble and operate (Figure 1). The POSaM platform uses mostly commodity, off-the-shelf components, with only a small number of components and circuit boards requiring custom fabrication. Schematics for the custom components are included in Additional data files 1 and 2, which also include instructions for assembling the POSaM. The rest of the user manual, with instructions for use, is in Additional data file 2. (Mechanical drawings are AutoCADDWG format; layout files may be used to order printed circuit boards over the Internet.) Because high-quality and high-density cDNA and oligoarrays are available commercially, our goal was not to build a large, high-throughput machine. We intended to design a flexible instrument capable of producing a myriad of different oligoarrays quickly and inexpensively. To meet these goals, we constructed an instrument (Figure 1a) that is capable of printing multiple slides in parallel, typically four to eight, but up to 27 slides with the current slide holder (Figure 1b), each with 9,800 different reporters on 8 cm2 of modified standard glass slides. Depending upon the surface chemistry of the substrate, the feature sizes range from 100 to 150 μm, with a center-to-center distance (pitch) of 280 μm. The system software, called Lombardi, controls the firing of the piezoelectric pumps, positions the print head, and dispenses the wash solutions. Normally four to six slides are printed at the same time. The cost for the reagents is low (less than US$50 per slide, see Table 1) as such tiny amounts of phosphoramidite and tetrazole are required. The POSaM platform. (a) Overview. The complete inkjet printing system is enclosed in an air-tight acrylic cover, 61 × 91 × 122 cm. (b) View from above showing the array holder. One slide is shown secured by the vacuum check with room for 26 additional slides. (c) Front view showing the print/wash head. Five PTFE wash lines deliver acetonitrile, oxidizer and deprotecting acid in bulk. Six vials supply tetrazole and phosphoramidites to the inkjet print head. (d) Lower-front view of the inkjet print head showing droplets passing through the QC laser beam. The presence of a droplet produces forward-scattered light, visible as bright red flashes (arrowed). Labor, safety equipment, and waste-disposal expenses are not included. Arrays printed on commercial epoxysilane slides require an additional $7 to $12. The POSaM platform is built around a three-axis servo-positioning system mounted to a low-vibration optical table and enclosed within a sealed acrylic cover that maintains a dry, inert atmosphere (Figure 1a). Array substrates (silanized glass slides) are vacuum-chucked into a PTFE (Teflon) slide holder mounted to the Y-axis stage. A piezoelectric print head and five valved wash nozzles are mounted to the X- and Z-axis stages, which move above the slide holder (Figure 1c). Reagent and waste bottles remain inside the acrylic cover, producing a closed system where the atmosphere can be controlled. Servo amplifiers, controllers (6K4), power supplies, the supervisory computer (PC), and most electronics are packaged in a standard 19-inch (~48 centimeter) rack system. All processes of the arrayer are directly controlled by the PC running the Lombardi program except for the basic motion-control functions that are handled by the 6K4 stand-alone controller (Figure 2). Diagram of the POSaM. The system uses two PCI-interface input/output boards (MIO-16E and DIO-32HS) and one ethernet-interface servo controller (6K4). Future software revisions will support a second print head, to provide more reagent channels, and the X-axis linear position encoder to increase printing speed. The three-axis positioning system utilizes Parker-Daedal 506-series ball screw linear actuators driven by servo motors (Olympic Controls, Wilsonville, OR) that can move the print head over a wide range with 5 μm repeatability. The Epson F057020 six-color print head has six banks of 32 nozzles, or 192 individually addressable piezoelectric pumps. We purchased one complete Photo 700 printer (Epson America, Long Beach, CA) to obtain a print-head holder and ribbon cable, and subsequent print heads from Agson Electronics (Cherry Hill, NJ). Misfiring of one of the 192 pumps has little or no effect when printing a color photograph on paper. However, when carrying out sequential oligonucleotide polymerization reactions, failure to add the appropriate reagent at the right time would result in an incorrect oligonucleotide, potentially ruining the whole array. Therefore, proper function of each of the 192 piezoelectric nozzles is critical. On the POSaM platform, nozzle performance is verified using a laser droplet detection subsystem (Figures 1d, 3). A red laser diode is mounted orthogonally to the direction of print-head motion such that the droplet stream of each bank of nozzles intersects the beam, causing the light to scatter if a droplet is present. 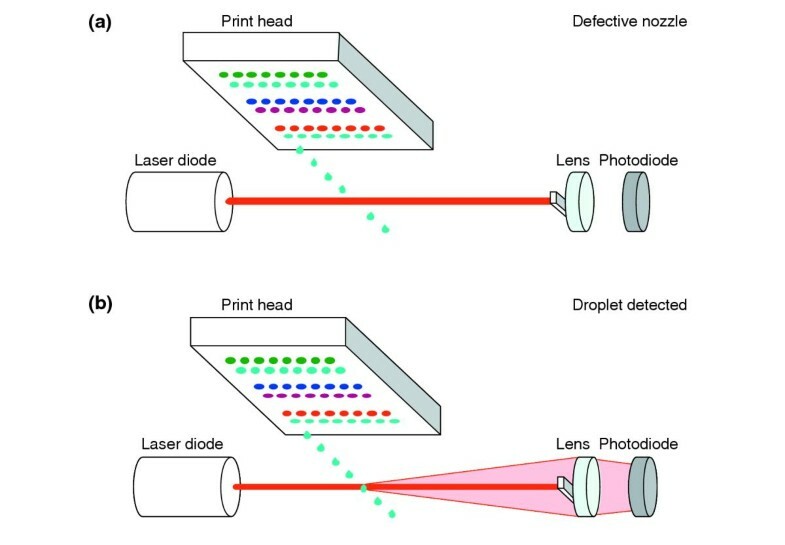 Before each round of printing, nozzles are fired in series through the beam and the forward scattering of each droplet is detected by a red-sensitive photodiode. The output signal is amplified, differentiated and converted to a digital signal by threshold comparison. Nozzles failing to fire are taken off-line during synthesis. After each test, Lombardi calculates a printing strategy that minimizes the number of passes required by the print head to print all of the features scheduled for the array. 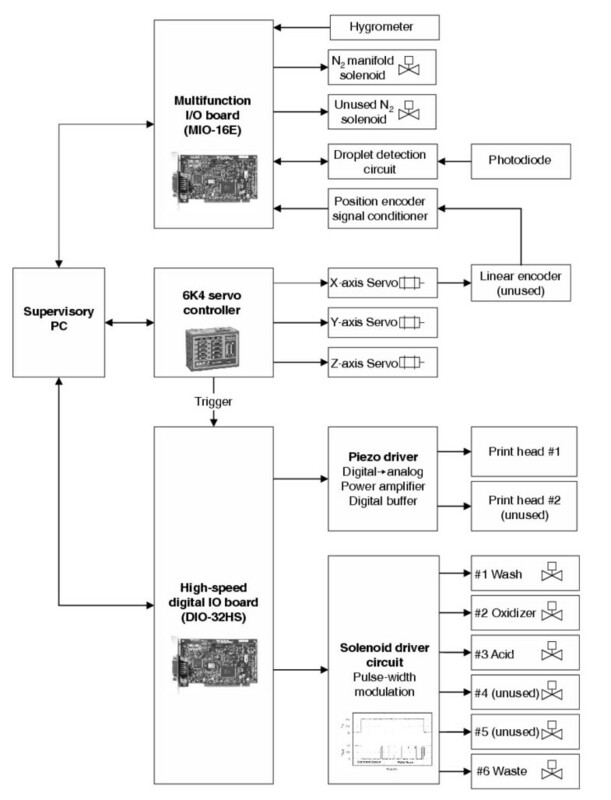 Design of quality-control droplet-detection subsystem. Before each cycle of synthesis the inkjet print head is moved over the light beam of a red diode such that the stream of droplets ejected from each pump intersects the beam at right angles. (a) If a nozzle is defective, there is no droplet ejected into the light beam, light is not scattered and the narrow beam is absorbed by a bar placed before the lens of the photomultiplier tube. (b) If the nozzle is functioning, a droplet intersects the light beam and scatters the light, which is then focused on the photomultiplier tube (PMT) to signal that the nozzle is functioning correctly. The state of the droplet is held by a D-type flip-flop. The circuit is reset just before droplet ejection and the state is read immediately after. If nozzle failures are detected, the software reschedules the motion and firing of the printing head so that the most efficient printing path is taken. Reagents and waste are stored in glass bottles with GL-45 screw-top caps. Amber 500 ml bottles hold oxidizer and deprotection acid, while clear 2 l bottles hold acetonitrile and waste. Pressurizing nitrogen enters the reagent and solvent bottles through PTFE check valves and the waste bottle is under vacuum. Six PTFE solenoid valves (Model 190224S30, Angar, Florham Park, NJ) are used to control the flow of acetonitrile, oxidizer, acid, waste and other reagents. Acetonitrile, the preferred solvent for automated phosphoramidite synthesis, is not suitable for inkjet printing due to its high volatility; droplets may even evaporate before contact with the slide surface. In addition, phosphoramidite precipitates can accumulate on the print head and clog the nozzles. Propylene carbonate is one less-volatile alternative that has been shown to produce coupling efficiency of 94-98% for inkjet synthesis . After extensive investigation of the properties of different solvents, we found that a 1:1 mixture of methyl glutaronitrile (MGN) and 3-methoxypropionitrile (3MP) had the most favorable combination of volatility, solubility, surface tension and synthesis parameters. The mixture readily dissolves phosphoramidite monomers at a concentration of 250 mM and produces coupling efficiencies similar to acetonitrile or propylene carbonate. Average stepwise coupling efficiencies were determined by trityl analysis during synthesis of three 20 mers on an ABI 392 synthesizer. Acetonitrile, 3MP, and propylene carbonate produced efficiencies of 97.2 ± 1.5, 97.1 ± 1.2, and 93.0 ± 1.3%, respectively. MGN and 3MP/MGN mixtures could not be used with the ABI 392 owing to their high surface tension; however, comparison of the hybridization intensity of arrays made with propylene carbonate and with 1:1 MGN:3MP produced comparable results (data not shown). The 1:1 MGN:3MP mixture jets easily, evaporates slowly, and forms discrete 'virtual' reaction wells on epoxysilane-modified slides because of its favorable surface tension (Figure 4). Photomicrograph of virtual reaction wells on silanized glass. Phosphoramidites and tetrazole dissolved in 1:1 3MP:MGN were printed onto a standard epoxysilane-modified slide surface. The slide was carefully removed from the POSaM instrument and a photomicrograph made using 50 × magnification of a light stereomicroscope with a cooled-CCD digital camera (1,392 × 1,040 resolution). ImageJ was used to draw the scale line on the photomicrograph. Inert gas and pressurization is supplied to the system by a liquid nitrogen dewar. The whole instrument is enclosed with a custom acrylic cover with an internal volume of approximately 510 l. The cover is transparent and airtight. It has a single latched access door and a glove panel that allows operators to work inside the enclosure without opening the access door. The inert gas flow is controlled by a 0-100 liters per minute valve/rotameter. This gas supply displaces the air inside the enclosure and powers the air amplifier that circulates the internal atmosphere through a series of activated charcoal and desiccant filters. The levels of moisture and oxygen, both toxic to phosphoramidite synthesis, must be minimized. Nitrogen is flushed continuously through the enclosure starting at least 40 minutes before synthesis and ending only after the last cycle. Humidity is logged automatically by the machine; oxygen levels are checked periodically by the operator. Levels are maintained below the instruments' limits of detection. The slide holder (Figure 1b) was machined from a solid block of PTFE with O-ring inserts so that 27 slides can be secured in place by a vacuum. Inclined troughs beneath the slides aid in collection and removal of waste reagents. New designs for the slide holder that improve printing and washing speed are currently being investigated. The Lombardi software was designed to fire each piezoelectric pump on the fly as the print head passes over the slides. Before each round of printing the software examines the operation of each of the 192 pumps (see QC description above) and determines the optimal movement of the print head and firing order of the piezoelectric pumps. The time for array synthesis depends primarily on the length of the sequences being printed, and to a lesser degree on the number of slides being printed, the number of features on the chip, and the number of nozzle failures. Currently, the rate-limiting steps in oligoarray synthesis are the washing and drying of the slides. Nozzle failures can be minimized by flushing the print head with pure solvent immediately after completion of array synthesis. Nozzle failures have not been a significant problem using the 1:1 MGN:3MP solvent system. The median number of nozzle failures is 3 out of 192. As the print heads are very cheap, it is our practice to replace them every three months. This is more of a precautionary step rather than being required by an accumulation of nozzle failures; at three months it is unusual to have more than a few plugged nozzles. The average diameter for each feature was determined by measuring the dimensions of 40 oligonucleotide features chosen at random from four arrays printed on Xenopore (Hawthorne, NJ) Xenoslide E epoxy slides. After printing and hybridization with a complementary, fluorescence-labeled oligonucleotide, the arrays were scanned with a confocal laser scanner and the diameters were determined using ImageJ software . The slides produced a feature diameter of 156 ± 16 μm. Similar results were observed using Bioslide (Walnut, CA) Precision CT Epoxy slides. Most of the following data was obtained using Xenoslide E substrates; however, the primary source of array failure is due to inconsistencies in the slide surfaces, even within commercial slide lots. We have found that the most consistent slides, by far, are those produced by our liquid deposition protocol (described in Materials and methods). In addition, these slides are much cheaper than the commercial alternatives. This protocol was used in the yeast barcode experiment described below and is now part of our standard operating procedure. The hydrophobic surface of the silanized glass slide causes droplets of oligonucleotide synthesis reagents to form discrete virtual reaction wells (Figure 4). These picoliter-scale droplets should be perfectly round and approximately 150 μm in diameter with a contact angle of around 45°. However, as stated above, this has been the most problematic step in the POSaM system. Several types of virtual well problems have been observed (Figure 5). On less hydrophobic surfaces, the virtual well system can collapse (Figure 5b,d). In other cases the diameter remains reasonably small, but the virtual well shape is ragged rather than round (Figure 5b,e,f). If any of these problems occurs the slides must be discarded. However, a simple change, such as printing phosphoramidites before tetrazole, appears to help maintain virtual well integrity. Changing the solvent ratio (3MP:MGN) from 1:1 to 1:3 also improved the integrity of the wells; however, the solutes are less soluble in the 1:3 3MP:MGN solvent and were more likely to clog inkjet nozzles. While these changes improved printing characteristics, the failure rates were still as high as 50% when using commercially produced slides. Slides produced by the simplified surface-modification protocol described in Materials and methods improved our success rate to between 80-90%. This new modification process is reliable and trouble free, and is now the standard way we produce slides. Photomicrographs of virtual well successes and failures. Slides were printed and photographed as stated in Figure 4 with the following modifications. (a) Virtual reaction wells are each formed by printing a droplet of phosphoramidite solution followed by a droplet of tetrazole solution using the standard 1:1 3MP:MGN. (b) Tetrazole droplets were printed before phosphoramidite droplets. Discrete virtual reaction wells fail to form. (c) Wells formed by printing two droplets of phosphoramidite solution. (d) Two droplets of tetrazole solution printed with no phosphoramidite. Virtual wells fail to form. (e) Phosphoramidite and tetrazole dissolved in 1:3 3MP:MGN and phosphoramidite printed first. Virtual wells form well. (f) Two droplets of tetrazole in 1:3 3MP:MGN solvent. Although not perfectly round, virtual wells do form. 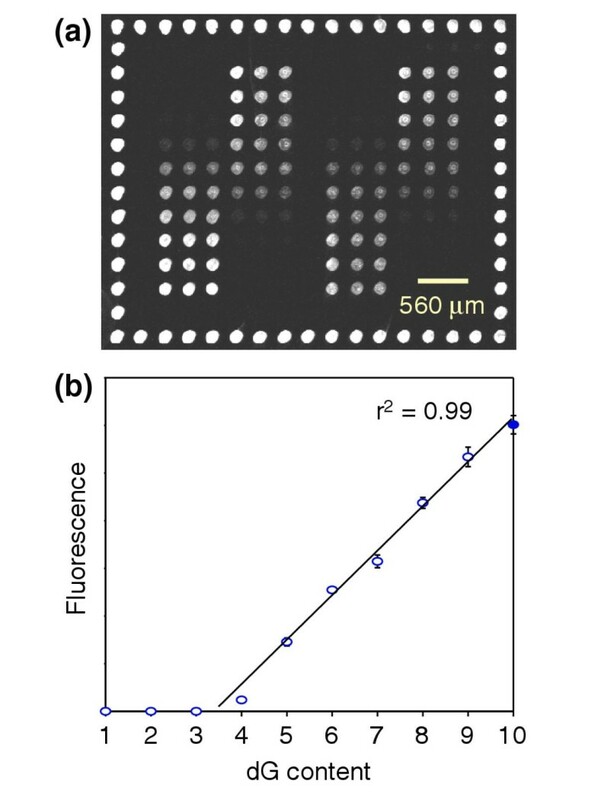 The size, shape and composition of the array features were observed by chemically modifying the oligonucleotides with fluorophores after inkjet synthesis. Figure 6 shows arrays of 25-base oligonucleotides that were synthesized containing from 1 to 10 guanine bases. These oligonucleotides were directly labeled using the ULYSIS labeling kit (Molecular Probes, Eugene, OR) which covalently attaches Alexa-594 dye to the N-7 of guanine bases . Figure 6b shows that the fluorescence intensities are linearly proportional to the guanine content of the sequence. The reporters were found to be generally round and uniformly positioned. The features that form uniformly staining rows or columns around the outside of the array are 20 mers complementary to a standard, labeled control oligonucleotide that is used to judge the quality of the slide and aid in placing grids around the array for the spot-finding program. Chemical labeling of an oligonucleotide array. Four sets of 25-base oligonucleotides were synthesized in triplicate on standard epoxysilane-modified glass slides using the 1:1 3MP:MGN solvent system, printing phosphoramidites before tetrazole. Each oligonucleotide contained from 1 to 10 guanosine residues. Alexa-594 dye was conjugated to the guanine bases using the instructions included in the ULYSIS kit (Molecular Probes), and the slide was scanned on the ScanArray using 10 μm resolution at standard laser and PMT settings. Fluorescence intensity was determined using the Dapple spot-finding program. (a) Laser scan of the array. 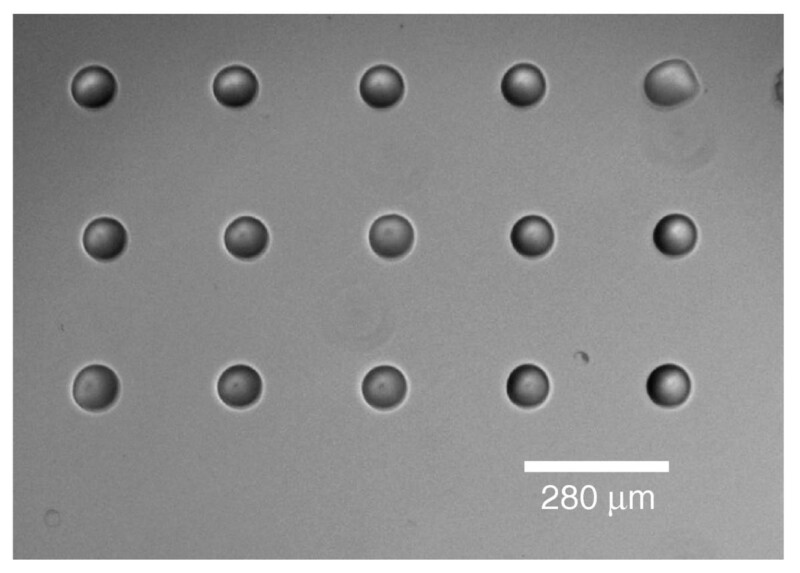 The spots surrounding the experimental Alexa-labeled spots are standard gridding spots that are prehybridized to a control Cy5-labeled oligonucleotide, and are included on all arrays to facilitate grid placement and as a check on virtual well formation. (b) Fluorescence intensity from Dapple output graphed against the number of dGMP residues in the molecule. A good linear fit is observed (r2 = 0.99) and shows fluorescence intensity to be proportional to guanine content between four and 10 bases. Hybridization specificity was assessed by synthesizing reporters with transitions and transversions in relation to the target sequences (Table 2). Figure 7 shows that mismatched bases result in decreases in hybridization intensity from 25% to more than 90%, confirming that oligoarrays can be used for SNP detection. Figure 8a shows that transitions or transversions that substitute a guanine for another base were slightly less destabilizing than substitutions to other bases. Figure 8b shows that mismatches at the ends of the reporters were less destabilizing than mismatches in the center of the molecule, as expected [19–21]. The lowercase letters represent nonspecific sequence that serves as a spacer or to extend the oligonucleotide to a certain length. Sensitivity of mismatch detection. Slides were printed and fluorescence measured using the standard methods described in Materials and methods. (a) Fluorescence from reporters containing from zero to four mismatches to the target 12 mer (5'-Cy5-GCG TTG GCA CTG). Mismatched bases are in bold. (b) Fluorescence from reporters containing from zero to six mismatches to the target 20 mer (5'-Bodipy-GAC CTC CCG GAC ACG CAC CT). A single mismatch reduces the binding of the 12 mers by 64% and of the 20 mers by 25%. Mismatched positions are in bold. Effects of mismatch type and position on inkjet oligonucleotide hybridization. Slides were printed using standard conditions described in Materials and methods. Reporter sequences representing all possible single-base mismatches in a 12 mer duplex were used. (a) The substitution of a non-guanine with a guanine (G) within the probe sequence was slightly, but significantly, less destabilizing than the other types of substitutions. (b) The destabilizing effect of the mismatch was less at the very ends of the probes than in the central positions. Position 1 is closest to the substrate; position 12 is furthest away. Comparisons of the absolute intensity of fluorescence signals between features is always difficult because of variation in DNA concentration, labeling efficiencies, and background signal; therefore, most array experiments use two-color competitive hybridizations. Reference and experimental samples are labeled with different fluorophores and hybridized to the same reporters. 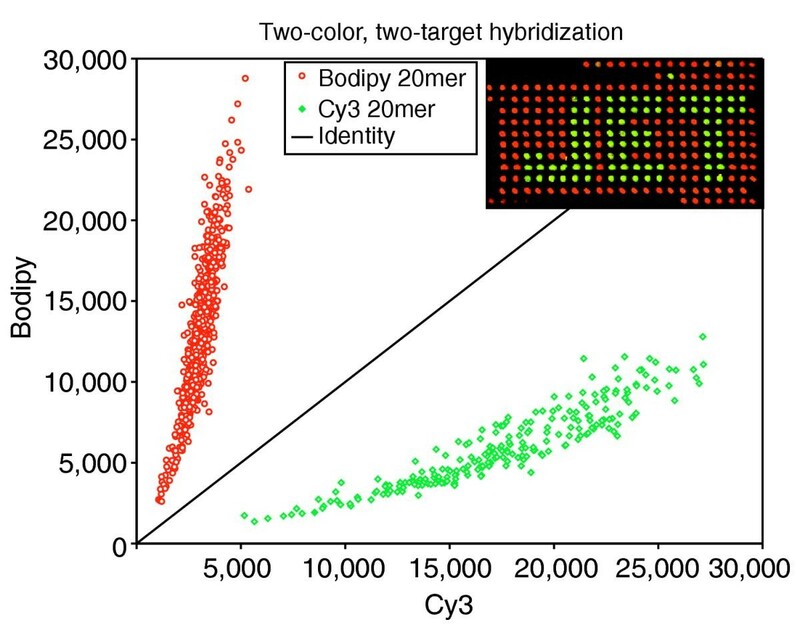 The ratio of the two colors (for example, green and red) hybridizing to one reporter provides an indication of changes in gene expression. Using this approach, the hybridization specificity of POSaM reporters was measured using labeled targets that differ by only two bases (T20r and T20g of Table 2). The green/red ratios of the complementary features were 3.12 ± 0.57 (N = 230) and 0.25 ± 0.05 (N = 660), respectively (Figure 9). Good ratio uniformity, small standard errors, and excellent discrimination by the two reporter sequences were observed. The insert in Figure 9 shows that the specificity is easily observed visually, when the different sequences are printed in an obvious pattern (see the word 'JET' formed by T20r targets). Sensitivity to mismatches as demonstrated by two-color hybridization. An array was synthesized containing reporters complementary to targets 5'-Cy3-GAC CTC CCG CTC ACG CAC CT (green) and 5'-Bodipy-GAC CTC CCG GAC ACG CAC CT (red), using standard conditions described in Materials and methods. The bases in bold are different in the two reporter:target molecules. The slide was hybridized with an equimolar mixture of the two labeled target oligonucleotides and the fluorescence intensity determined on the ScanArray 5000 using the Dapple spot-finding program. The green/red ratios of the green- and red-complementary features were 3.12 ± 0.57 (N = 230) and 0.25 ± 0.05 (N = 660), respectively. Graphing Cy3 intensity vs Bodipy intensity shows excellent separation between signals and the insert shows that the effects of two base changes are clearly distinguishable by eye. As the substrate modification must be sufficiently robust to withstand multiple cycles of oligonucleotide synthesis, it stands to reason that the inkjet arrays could be regenerated and re-used. Figure 10 shows the effects of repeated hybridization followed by the stripping of target DNA with a 20 mM NaOH solution. Arrays were washed and rehybridized 10 times without a serious loss of signal-to-noise or specificity from reporters for T20r and T20g. In this case, each wash cycle resulted in an average signal attenuation of less than 11%, although in other cases signal attenuation was greater. Background levels did not increase. Fluorescence intensity between base washing and repeated hybridization was reduced by 99%. 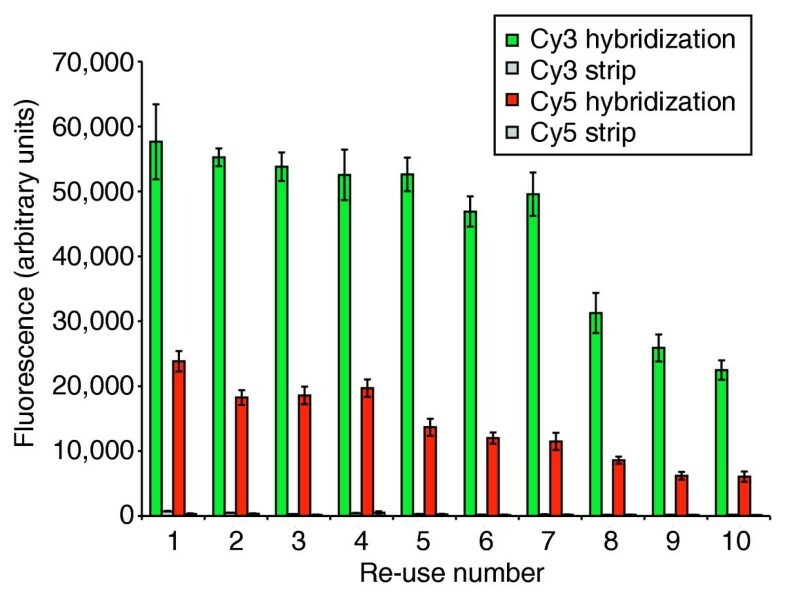 It was observed that rehybridization was less successful if stripping was not performed within two days after the initial use (data not shown). POSaM oligoarray re-use. Arrays of our 20 mer gridding sequences were synthesized as described in Materials and methods. The arrays were then hybridized to Cy3- or Cy5-labeled complementary target molecules and the fluorescence intensity determined as described above. Intensities were recorded and the slides were stripped of target DNA by incubation in 20 mM NaOH for 2 min at room temperature. The fluorescence intensity of the stripped slides was measured and the slides were rehybridized using the same targets as before. These hybridizations, intensity measurements, stripping, intensity measurements, and rehybridizations were repeated at least 10 times. Stripping reduced fluorescence by an average of 99%. Signal intensity and specificity appears unchanged during the first four cycles of use. The sequences used are identical to those in Figure 8: Cy3-labeled targets are perfectly complementary; Cy5 differ by two adjacent mismatches. With the specificity and re-usability of inkjet arrays validated by hybridization with oligonucleotide targets, we tested arrays with a complex sample of PCR products prepared from the genomic DNA of 94 yeast gene-deletion strains. Accurate oligoarray measurement of deletion barcodes will greatly simplify the analysis of growth phenotypes. For example, a competitive growth condition may be applied to a pooled culture containing equal proportions of each strain. The oligoarray can measure changes in the quantity of each barcode strain and, therefore, the change in each population from initial to final culture [22, 23]. In this experiment, 94 different barcoded yeast deletion strains were grown together in rich medium. Three additional strains, YPL110C, YPL111W, or YPL112C, were grown in separate cultures. Genomic DNA was isolated from the mixed strains and three individually grown strains, and barcode tags were amplified and Cy5-labeled by PCR using 1 μg genomic DNA. To simulate increased growth of three strains, barcode tags were amplified and Cy3-labeled by PCR using 1 μg DNA from the first culture plus 100 ng DNA from each of the three additional cultures. The two labeled samples were mixed and hybridized to an inkjet array containing reporter sequences complementary to the barcodes. 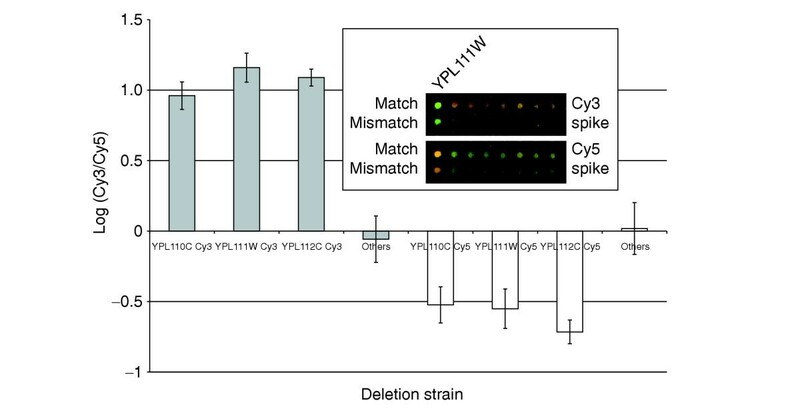 As expected, the fluorescence signal detected from Cy3 was approximately 10-fold stronger than Cy5 for strains YPL110C, YPL111W, and YPL112C, whose DNAs were spiked into the hybridization. The Cy3/Cy5 ratios were between 10:1 to 14:1 (N = 4), respectively, compared to approximately 1:1 for the unenriched strains. After scanning, the microarray was stripped with 0.2 N NaOH and reused for a dye flip (the Cy3 and Cy5 dyes reversed) experiment. Again, enriching the Cy5 signal by spiking the three strains greatly increased that signal (Figure 11). 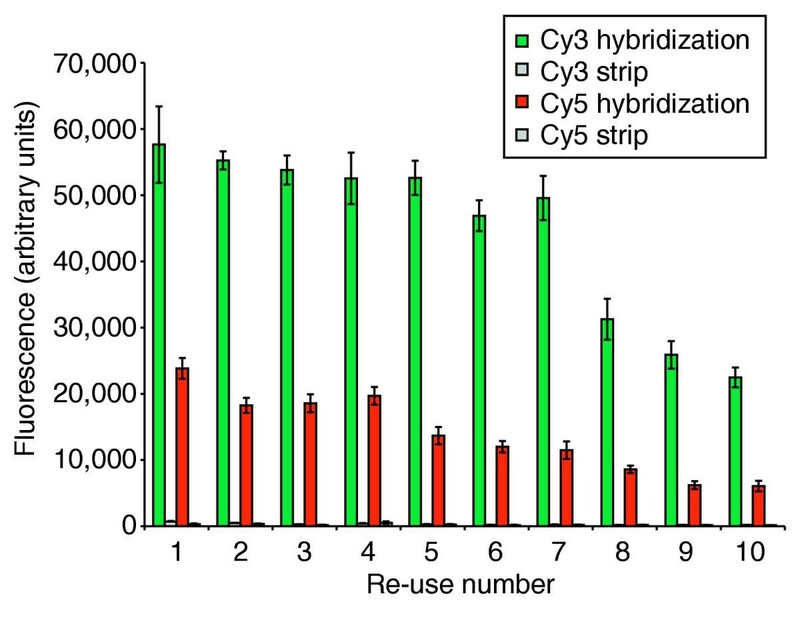 The Cy3/Cy5 ratios were 0.1:1 to 0.3:1, respectively, compared to 1:1 for the unenriched strains. Detection of yeast deletion-strain barcodes from genomic DNA. Barcodes from 94 strains were PCR amplified and labeled with Cy3 and with Cy5, combined, and hybridized to an inkjet array. Approximately 10-fold additional genomic DNA from YPL110C, YPL111W and YPL112C was spiked into the Cy3 PCR, resulting in a 10-fold increase in Cy3 fluorescence from the corresponding reporters (gray bars). The array was stripped and the experiment was repeated, spiking the three strains into the Cy5 PCR. This resulted in a four- to fivefold increase in Cy5 fluorescence from the corresponding reporters (white bars). The laser-scan images in the inset show the increased Cy3 (green) signal from the YPL111W spike reporter in the first hybridization and increased Cy5 (red) signal from the YPL111 W spike reporter in the second hybridization. Signal is detected from the mismatch reporter as well, but at a greatly attenuated level. The slides used as substrate in this experiment have been modified using our own method as described in Materials and methods. A major drawback of conventional microarray fabrication is the time and cost required to develop a new array. When a new genome is sequenced, when additional expressed genes are identified, or when polymorphisms are discovered, a great deal of time and money is required to create a new microarray. The photolithographic technique, such as that used by Affymetrix , requires the fabrication of up to 100 chrome/glass masks for de novo synthesis of a new 25 mer oligonucleotide array. Spotted arrays can only be fabricated after the characterization of thousands of DNA fragments is completed, and the reporters have to be replicated, cataloged, and stored. New POSaM arrays, however, can be designed, synthesized, hybridized and scanned in a single day. Key properties of the POSaM platform is that fabrication of a new array is flexible and rapid, and cost is practically independent of the number of sequences or the number of different arrays to be synthesized. Once the inkjet is running, it does not matter if the arrays contain 100 reporters or the current maximum of 9,800 features; there is no additional set-up cost for a new design other than the time it takes for the reporter selection process. The cycle times for covalent attachment of each base in a reporter ranges from 11 minutes for one array to 20 minutes for eight arrays. Six arrays of 40 mers can be produced in about 13 hours. As each oligonucleotide reporter can be of a different length, it is possible, by varying the length of the reporter, to design arrays where all the theoretical melting temperatures are very similar. Inkjet oligoarray synthesis uses highly efficient, well characterized phosphoramidite chemistry with sequences that are stored in a database rather than in a freezer. This eliminates the cost of amplification, replication, storage and retrieval of the reporters, as well as minimizing the errors that are generated when cataloging many large DNA libraries. Inkjet arrays are particularly well suited for applications where small numbers of arrays are required or where rapid reporter redesign is likely. A prime example is validation of reporters used for gene-expression arrays. Despite continual efforts to determine the definitive computational algorithms for designing unique oligonucleotide sequences that will specifically identify and quantify the amount of mRNA present in a given sample, many of the reporters predicted by these programs do not work. Ultimately, final reporter selection usually requires investigators to determine empirically which reporters work with the different samples used. It is desirable to know that a reporter set has sufficient specificity and sensitivity to detect genes of interest before many weeks of time and thousands of dollars are invested in large-scale synthesis and purification of the DNAs or fabrication of the masks needed for photolithographic synthesis. As the turnaround time for new arrays is so fast and the cost of printing 9,800 reporters is so small with the POSaM platform, many different oligonucleotide sequences can be tested to optimize the sensitivity and specificity of the reporters. We estimate that it costs (including labor) approximately $300 to synthesize a set of six arrays (the number of arrays that is easily produced in a single day). Material costs are itemized in Table 1. These arrays could be identical or contain completely different reporters, as the number of different sequences printed does not change the cost or speed of synthesis. The fact that the arrays may be stripped and re-used will be very helpful for optimizing hybridization conditions. Specificity and sensitivity can be measured under different buffer and temperature conditions on the same array to reduce cost. Because the same sample would be applied in every condition, residual signal of less than a few percent would not be a problem. In theory, other types of arrays that use covalent linkers should also be re-usable. It has recently been reported that some UV-crosslinked cDNA arrays can also be reused . The discovery and development of chip-based oligoarray applications other than the regulation of gene expression can benefit from the flexibility inherent in POSaM oligoarray synthesis. We show here that POSaM-based arrays can be useful for identifying changes in the population fraction of barcoded yeast deletion mutants placed under selective growth conditions. In designing the chips for this experiment, we found that the thermodynamic stability and the intensity of the signal of the duplexes was enhanced by including 15 bases from the regions flanking the 20-base barcode, but that only a little specificity was lost by including these complementary regions, although this could account for the low background of binding seen in the mismatched barcodes. For most purposes, reporters of length 30 to 35 nucleotides provides an optimum combination of sensitivity and specificity . In addition, analysis of protein-binding sites in native chromatin, using ChIP-to-Chip methods  or DamID  assays require reporter sequences that include the noncoding regions of genomic DNA. Few commercial microarrays are available containing these intergenic regions because the cost of synthesizing or cloning every noncoding region in a genome is exorbitant. Inkjet arrays have been designed and printed with the POSaM platform where reporters tile across putative regulatory regions from -1,000 to +200, relative to the site of transcription initiation, with a step size as small as one base. Because the immunoprecipitated chromatin can be chemically or physically sheared into smaller fragments, the sequences complementary to the binding sites can be narrowed down to a much smaller region using arrays made on the POSaM platform (data not shown). This experimental data can supplement computational techniques to determine novel cis-acting binding sites and is currently being tested using the well defined yeast galactose utilization pathway, a model system used in our laboratory. We are also expanding upon the methods of Bulyk et al. by using the POSaM platform to synthesize 40-50-base double-stranded (ds) DNA oligonucleotides that contain a common primer sequence as well as potential cis-acting protein-binding motifs. The standard single-stranded (ss) DNA arrays can be converted into dsDNA arrays using primer extension reactions, and these unique dsDNA chips, which tile across putative regulatory regions, can be used to detect protein binding from nuclear extracts. With the availability of specific antibodies against most known transcription factors and with advances in surface plasmon resonance (SPR), atomic force microscopy (AFM), and MALDI-TOF tandem mass spectrometry (MS/MS) techniques, it should be possible to identify the proteins and protein complexes bound to the dsDNA arrays. In a separate project, we designed and constructed a temperature-ramping microarray scanner that, when used with POSaM produced slides, can monitor the dissociation kinetics of each reporter/target on the array, achieving single-base mismatch resolution. Besides the obvious use for SNP detection, the ability to synthesize any sequence of DNA and determine the apparent dissociation constant make it possible to test the algorithms and heuristics used to select reporters, thereby increasing our understanding of how nucleic acids interact. There are several areas where the design can be improved. First, since the QC testing of the print head with the laser droplet detector cannot take place during actual printing, intermittent nozzle failures may go undetected. Our current solution is to double-print each slide under the assumption that random nozzle failures are less likely to occur and go undetected at the same nozzle twice in a row. A more elegant solution, which we are in the process of adding, is to incorporate a real-time visual monitoring system that detects the presence or absence of droplets as well as whether the droplets are the correct shape and in the correct position. The total cost for the assembly of the POSaM platform is currently about $34,000. The real-time image analysis system that we are testing increases the cost by about $4,000. Second, the Epson Photo 700 printer has been discontinued. While new replacement print heads are still available, it is inevitable that they will become scarcer and more expensive. Fortunately, the electrical interface changes very little with each new model. We are redesigning the print head assembly to make it easier to adapt the POSaM to future print-head models. Third, the washing and drying steps are array synthesis bottlenecks. New slide-holder designs, along with modifications to the software, are being considered. Fourth, with improvements to the slide surface chemistry, it may be possible to greatly increase feature density. These are projects that we are currently investigating and that can benefit from the open-source process. We are also sure that new POSaM users will suggest additional improvements. While de novo synthesized oligonucleotide arrays are starting to become available commercially, there remains a need for an open-source version of the inkjet oligonucleotide arrayer in the spirit of the pin-spotting instrument and software first released by the Brown and DeRisi laboratories in 1998. This open-source instrument accelerated the growth of the array field by allowing early adoption of the technology by laboratories with the desire and technical ability to construct their own instrument, provided a standard design that both laboratories and public-sector manufacturers could use to improve the instruments and methods, and it also allowed end users to take control of microarray design and decide what arrays would be available. A shared, non-proprietary arrayer allows end users to tinker freely with the design and make improvements as needed. Thus, we believe that making the POSaM platform freely available to academic laboratories will accelerate the development of better instruments. In addition, the selection of reporter sequences could be standardized, oligoarray chip applications expanded, and science would be accelerated in a positive, productive manner. We believe that POSaM-like inkjet systems can be constructed by most well equipped molecular biology laboratories with modest organic chemistry and engineering expertise. The most unfamiliar step in the construction of the POSaM platform was the construction of circuit boards; however, once the boards in the present platform were designed, they were soldered and tested by undergraduates in our laboratory. While the surface chemistry of the substrate is still somewhat problematic, the development of the new modification protocol described in the Materials and methods brings the success rate to an acceptable 80-90% and the release of this instrument into the public domain should facilitate the development of the instrument, protocols and new uses for oligonucleotide arrays. Substrates were prepared by derivatizing clean microscope slides with 3-glycidoxypropyltrimethoxysilane (GPTMS). GPTMS was obtained from Acros Organics USA (Morris Plains, NJ). Fisher Scientific (Pittsburgh, PA) 'Premium' 25 × 76 mm microscope slides were cleaned by immersion in Nano-Strip cleaner (Cyantek, Freemont, CA) at room temperature for 30 min, followed by five rinses of 5 min each in de-ionized water. The slides were incubated overnight in 10% NaOH at room temperature and were again rinsed with de-ionized water (5 × 5 min). The slides were soaked in 1% HCl solution for 1 min at room temperature followed by rinsing in de-ionized water (2 × 5 min). The slides were oven-dried at 150°C for 90 min and cooled to room temperature under a stream of nitrogen. For liquid deposition, slides were immersed in a solution of 2.5% GPTMS in Rain-X (SOPUS Products, Houston, TX) and sonicated for 2 min. Following sonication, slides were cleaned by immersion in 100% ethanol for 2 min, de-ionized water for 5 min, and dehydrated in 100% acetone for 5 min. On removal from acetone, the slides were immediately spun dry at 1,000g and stored in a desiccating cabinet until use. Just before arraying, the silanized substrates were washed in 100% methanol (10 min, room temperature), rinsed in de-ionized water, and rapidly dried under a stream of nitrogen. The printing area, approximately 25 mm × 25 mm in the center of the slide, was marked on the underside with a pen and the margins of the slides are treated with Rain-X to increase the hydrophobicity of the bounding regions. The highly hydrophobic margins serve to constrain the bulk washes to the active area of the slide, reducing reagent use, and aiding reagent removal. The inkjet oligonucleotide synthesis process uses standard phosphoramidite chemistry as described by , and modified for use in automated oligonucleotide synthesizers by . Nucleoside phosphoramidites (bzdAMP, AcdCMP, ibudGMP, dTMP), 5-ethylthio-1H-tetrazole, and oxidizer (0.02 M iodine in pyridine/tetrahydrofuran/water) were purchased from Glen Research (Sterling, VA). Phosphoramidites and 5-ethylthio-1H-tetrazole were dissolved at 0.25 M in a mixture of 50% 3-methoxypropionitrile and 50% glutaronitrile (Sigma, St. Louis, MO). The solvents were dried for two days on molecular sieves before use. Synthesis-grade anhydrous acetonitrile and high-purity dichloromethane and dichloroacetic acid were purchased from Sigma. The detritylation solution used was 2.5% dichloroacetic acid in dichloromethane. 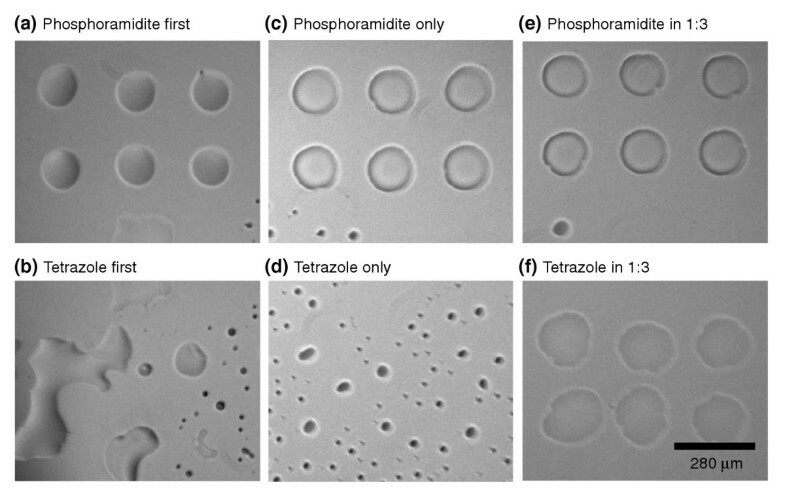 Only 6 pl of phosphoramidite monomers and tetrazole were spotted on the slide using the inkjet print head; all other reagents were added 1 ml at a time using PTFE solenoid valves. The internal atmosphere of the platform was flushed with dry nitrogen for 30 min at 60 l/min before synthesis is initiated. Humidity was monitored using a capacitance hygrometer (Model 4187, Control Company, Friendswood, TX) and oxygen was measured using an Oxy-Plus electrochemical device (Brandt Instruments, Slidell, LA). The nitrogen stream continued at 35 l/min until synthesis was complete. Slides were washed three times with acetonitrile. The reagents were blown off the edge of the slide with a reciprocating motion from a manifold of nitrogen jets. Each cycle of synthesis includes (1) printing, (2) washing, (3) oxidation, (4) washing, (5) detritylation, and (6) washing. The first step of the reaction consists of phosphoramidite monomer printing followed by tetrazole printing, followed by a 2 min incubation. This first 3' base was reprinted to ensure a high density of oligonucleotide synthesis. Oxidization and detritylation steps were also carried out for 2 min each. After reporter synthesis was completed, the microarray slides were removed from their slide holder and rinsed with acetonitrile and then 95% ethanol. The base-protecting groups were removed by a 105 min incubation in an aqueous solution of 13% ammonium hydroxide and 20% methylamine in a sealed container at room temperature. The deprotected slides were rinsed five times with de-ionized water, dried, and stored in a desiccator. Images were acquired using a Zeiss Axiophot stereomicroscope equipped with a 5 × Plan-Neofluor objective and standard 10 × planar eyepieces, connected to a Roper Scientific cooled-CCD digital camera (1,392 × 1,040 resolution, pixel size 6.45 × 6.45 μm, firmware revision 8.69). RS Image Acquisition settings were as follows: exposure type, normal; exposure mode, timed; automatic exposure with intensity target of 2,000 and upper limit exposure time of 1 sec; full-CCD mode with speed 20,000 kHz; gain equal to 1; no shutter delay; neutral brightness, contrast, and gamma, with white auto balance and 5%-95% scaling. Hybridizations were carried out using labeled targets listed in Table 1, purchased from IDT (Coralville, IA), and diluted to a 100 nM final concentration with DIG Easy Hyb buffer (Roche Molecular Biochemicals, Indianapolis, IN). Forty microliters of hybridization solution was placed on the microarray and a coverslip carefully applied. The slide was placed in a hybridization chamber and incubated for 1 h incubation at temperatures indicated in the figure legends. The coverslips were removed and the microarrays were washed for 15 min in 1 × SSC + 0.5 % SDS buffer followed by a 5-sec wash in 0.1 × SSC + 0.1% SDS at room temperature. The microarrays were dried under a nitrogen stream. Microarray images were collected using 10 μm resolution, 60-90% laser power, and 80-90% PMT gain on a ScanArray 5000 laser scanner (Packard BioScience, Meriden, CT) and saved as 16-bit TIFF images. The excitation/emission filter settings used were 532 nm/546 nm for measuring Cy3 and 633 nm/670 nm for Cy5 and Bodipy. The fluorescence intensities were determined using Dapple image-analysis software . Dapple output files, annotated with feature names and sequences, can be found in Additional data file 3. Microarrays were stripped by washing in 20 mM sodium hydroxide for 2 min, followed by five washes in de-ionized water. Nucleic acid and and fluorophore dye concentrations were determined by spectrophotometric measurement of absorbance at λ = 260 nm for nucleic acid and at the excitation peak λ = 550 nm for Cy3, λ = 650 nm for Cy5) for the dye reporter. Concentrations were calculated using appropriate extinction coefficients (A260 = 50 μg/ml dsDNA at 1 OD, A260 = 33 μg/ml ssDNA at 1 OD, A550 = 150,000 M Cy3, A550 = 250,000 M Cy5), and samples were normalized for each hybridization to provide equimolar amounts of each fluorophore. Oligoarrays of 20 mers were printed as described in the synthesis section of the Materials and methods, except that reporters contained from 0 to 10 dGMP moieties distributed along the length of the molecule. The position of reporters containing different numbers of dGMPs were randomized before printing. ULYSIS nucleic acid labeling kit (Molecular Probes) was used to label the N-7 position of the dGMPs by a modification of the instructions recommended by the manufacturer: 70 μl of degassed Universal Labeling System (ULS) reagent containing AlexaFluor-647 with DMSO was diluted 1:100 in Component C buffer. The reaction mixture was placed on top of the reporters on the oligoarray slide and incubated under a coverslip at 80°C for 15 min. After incubation, the coverslip was removed and the slide was incubated in 2 × SSC, 0.2% SDS for 10 min. Slides were thoroughly washed with de-ionized water, blown dry with compressed nitrogen, and scanned on a ScanArray 5000 microarray scanner using laser power and PMT gain settings of between 65% and 85%. Ninety-four different barcoded yeast deletion strains were grown in rich medium containing 100 mg/L G418 (geneticin) at 30°C. Three additional cultures containing only strain YPL110C, YPL111W or YPL112C were grown using identical conditions. After 4 h, the cell density was determined by the OD600. Two milliliters (approximately 5 × 107 cells) of each population were used to extract genomic DNA. Each set of cells was pelleted, washed with diH2O, pelleted again and resuspended in 200 μl breaking buffer (2% Triton X-100, 1% SDS, 100 mM NaCl, 10 mM Tris pH 8, 1 mM EDTA pH 8). Two hundred microliters of 24:1 phenol:chloroform and 200 μl siliconized glass beads were added, and the cells were lysed by agitation. Two hundred microliters of TE buffer (10 mM Tris-Cl, 1 mM EDTA, pH 7.5) was added and cell debris removed by centrifugation at 13,000 g for 5 min. The aqueous phase was collected and nucleic acids were precipitated by the addition of 1 ml 100% ethanol at room temperature followed by three minutes of centrifugation at 13,000 g. The pellet was resuspended in 400 μl TE. Contaminating RNA was hydrolyzed in the presence of 30 μg RNase A for 5 min at 37°C. Genomic DNAs were precipitated by the addition of 10 μl 4 M ammonium acetate and 1 ml 100% ethanol at room temperature. After centrifugation, the DNA pellets were resuspended in 100 μl of TE and the concentration determined by absorbance at 260 nm/280 nm. Barcode tags from the genomic DNA were amplified and labeled by PCR. Reactions were 100 μl in scale and contained 20 mM dNTPs, 150 mM MgCl2, 1 × Fermentas Taq DNA polymerase buffer, 100 μM each of Cy3 or Cy5 conjugated forward and reverse primers, 1 μg of the genomic DNA and 3.75 units of Taq DNA polymerase. The enrichment reactions were spiked with 100 ng each of DNA from barcode strains YPL110C, YPL111W and YPL112C. Mixes were heated to 94°C for 3 min, followed by 30 cycles of 94°C for 15 sec, 50°C for 15 sec, and 72°C for 30 sec. Reactions were finished by a final incubation at 72°C for 3 min. PCR products were purified using the Qiagen nucleotide removal kit following the manufacturers' recommended protocol. Each barcode array slide contained a grid of registration features containing sequences complementary to a labeled 20-base control oligonucleotide. Their hybridization is used to verify feature size, shape and uniformity, as well as to aid in the registration of grids used by the spot-finding program, Dapple. No cross-hybridization was observed between the barcode reporter sequences and the control oligonucleotide. The barcode reporters consisted of 38-base inkjet synthesized oligonucleotides. The 'perfect match' reporters contain 20 bases complementary to either the Watson or Crick strands of the identifying barcode plus 18 bases of primer sequence. 'Mismatch' reporters were also synthesized, containing four evenly spaced mutations. Each sequence was represented in quadruplicate in the array; thus each barcode PCR product could hybridize to eight perfect-match reporters. The purified Cy3/Cy5-labeled PCR products were quantified at OD550 (Cy3) or OD650 (Cy5) and 7 pmol of each labeled PCR product was used to probe the barcode oligoarrays. The PCR products were combined as in a 'dye-flip' experiment: one solution combining Cy3 reference reaction with Cy5 enrichment reaction and the other solution combining Cy5 reference reaction with Cy3 enrichment reaction. The solutions were concentrated by precipitation and resuspended in 47 μl 1 × DIG Easy Hyb buffer (Roche), 3 μl yeast tRNA (10 mg/ml), and 10 μl sheared salmon sperm DNA (10 mg/ml). The resulting mix was heated to 90°C for 1 min, placed on ice for 1 min, and kept at 42°C until use. POSaM oligoarray slides were prehybridized in a 3 × SSC (450 mM sodium chloride, 45 mM sodium citrate), 0.1% SDS, 0.1 mg/ml sheared salmon sperm DNA for 30 min at room temperature. The oligoarrays were washed in diH2O, dried, and hybridized with the labeled probe mixes for 1 h at room temperature. Hybridized slides were then washed with increasing stringency: first with 1 × SSC (150 mM sodium chloride, 15 mM sodium citrate), 0.2% SDS at 55°C for 5 min, then with 0.1 × SSC, 0.2% SDS at room temperature for 5 min, then with 0.5 × SSC at 45°C for 5 min, and finally with two washes of 0.1 × SSC at room temperature. Slides were dried with compressed air and scanned on a ScanArray 5000 with laser power and photomultiplier gain settings at 85%. Additional data available with the online version of this article consists of PDF files containing instructions for assembling (Additional data file 1) and using (Additional data file 2) the POSaM and a zip file (Additional data file 3) that contains the raw microarray fluorescence data used to generate the results shown in Figures 6, 7, 8, 9, 10, 11. The authors thank David Shteynberg, Brett Kotschwar and Matthew von Bargen for software development help, Stephen Mordue and Avid Shiau for testing, and Eva Aw for technical assistance. This work was funded by NIH grants HG01713 and HG02931.